Day 2 of our Death Valley roadtrip had us visiting the famous Racetrack, with rocks that move mysteriously across the mud playa, leaving tracks in their wake. Ok, maybe not all that mysteriously - some wet, slick mud and high wind conditions seem to explain it well enough, but it's pretty cool nonetheless. Tom and I had been there two years earlier but this would be Brian's first visit. With Tom's Jeep we planned to drive up Lippincott Rd, one of the rougher 4x4 routes in the park, connecting Saline Valley with the Racetrack. Tom was looking forward to having the opportunity to drive it because, as he's commented on more than one occasion, "That's why I bought it." I wasn't particularly looking forward to the drive since I seem to be somewhat of a wimp about getting bounced around in a steel box, but I'll endure quite a bit of such nonsense if it gets me access to new peaks. On the agenda were a couple of unnamed summits on the south and north sides of the Racetrack with a few bonus peaks thrown in to fill up the day. As it turned out, Lippincott wasn't as rough as we were expecting, much to my liking and perhaps a little disappointing to Tom. From Saline Valley Rd, Lippincott Rd forks off at the south end of the valley, the first three miles a tame traverse across the desert floor on decent roadway. It then spends the next four miles climbing 1,600ft up through one drainage and into a second before emerging at the far southern end of Racetrack Valley. The road was built back in the day to service the Lippincott Mine and others in the Racetrack area, some of which were active as late as 1952, extracting mostly lead, gold, and copper, none in very large quantities. Halfway up the canyon there is an old sign welcoming you to Death Valley dating to some time before the park's expansion in 1994. The road climbs impressively and there are several good spots to get views looking back down on the road just traveled. For the most part the road is still in good shape and can be negotiated by any high-clearance vehicle. Only near the top are there sections with rough rock where 4-wheel drive is needed. Once in Racetrack Valley we turned right and headed up to a parking spot near the Lippincott Mine. Another party was parked at a fine concrete pad area, with camp set up for an extended stay that included a canopy, BBQ, several large coolers and an expensive telescope, among other items. With more than 800ft of prominence, the first of these had caught my attention as a nice objective while in the area. It turned out to be a fine ridge climb that we extended with a visit to the lower bonus peak. 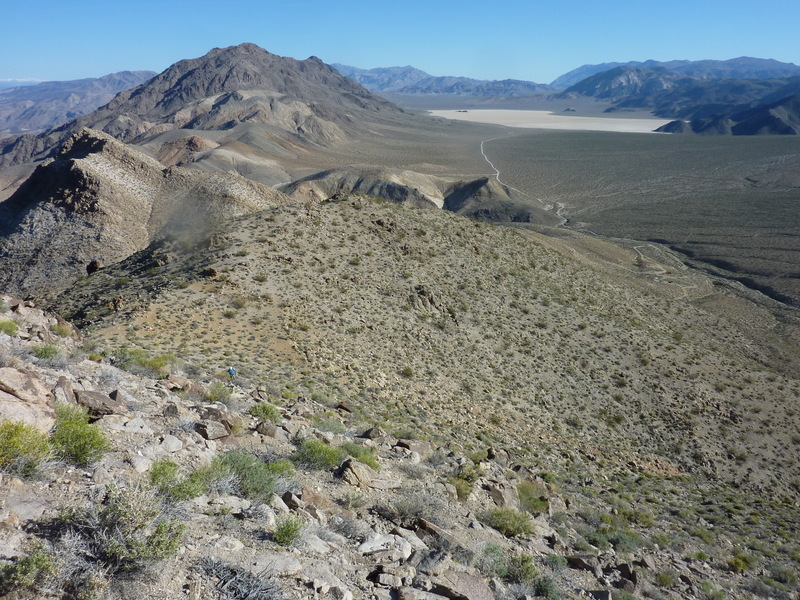 Tom was able to manuever the Jeep to within 1.3mi of the summit, near the end of the road spur leading to a couple of mining prospects north of the summit and above the Lippincott Mine. The initial climb was steep, leading to the more enjoyable portion along the north-south trending ridgeline with the Racetrack easily visible behind us. Ahead of the others, I was able to spot and then sneak up on a small herd of junior bighorn rams grazing on the north side of the summit. After watching them from a distance for a short time behind a rock outcrop, they suddenly looked up in my direction. Not far behind me, Tom had just popped up in his bright blue shirt that caught their attention - off they went. Even before Tom could join me a minute later to tell him what I was looking at, they'd covered a quarter mile and were out of sight over the skyline - it was the last we'd see of them. The summit was a short distance south of the false summit we were looking at in that direction and after just shy of an hour's effort we were at the top. To no great surprise, Gordon and Barbara had beaten us to the summit by some 37years, leaving a well-preserved register in a glass jar. Only three other individuals had signed it in the interim. Hunter Mtn can be seen high to the south, the Inyo Mtns dominate the view west and the much higher Peak 6,683ft lies to the east. While we were lounging about the top under fine weather conditions, I suggested we could pay a visit to Peak 5,060ft on our way back, making a loop of the outing. The others seemed happy to oblige me. We dropped off the east side of the summit to a saddle between the two peaks. The old 15' topo map shows an old road or trail going across this saddle south towards Dodd Springs, but we saw no sign of such route. We then climbed another 400ft, taking 15-20min from the saddle to reach the second summit atop Peak 5,060ft. Though lower than the first, the views looking north towards The Racetrack were far better. Finding no cairn or register here, we continued north along the ridgeline, eventually dropping to the drainage to the west and then traversing back to the Jeep. Before leaving, we took another half hour to explore the upper mineshafts of Lippincott Mine. These were impressive holes, a few dropping vertically, others blasted horizontally into the mountainside. The Park Service had spent some time and money to block these unsafe passages from the public with steel mesh barriers, but it seems at least a few folks found them a bother and cut their way around or through them. We ended up back at the Jeep a second time around 11:30a where we packed up and headed north. The higher of these is a P1K and the main reason I was interested in a return to Racetrack Valley. Located about 2.7mi north of Ubehebe Peak (also a P1K), we hadn't enough time on that first visit to tag this unnamed summit while in the area with an agenda that was already overbooked. As we were driving north towards it, Tom noticed some sandy slopes on its southeast aspect that looked like they would make for a good descent route. So we flipped the plan around to accommodate this, choosing to head to the bonus peak first, then the P1K, and finally the sandy descent. Without any turnouts in the vicinity, Tom parked the Jeep high on one side of the roadway to allow other vehicles to pass and off we went across the desert flats to the west. Near the start we noticed a high number of old, rusted fuel cans and discarded food tins. They weren't piled about like a typical trash dump site, but rather spread about the desert floor almost as though someone was setting up for target practice - only there were no bullet holes indicating such use. After about 3/4mi we began ascending the somewhat loose limestone slopes, gaining the main crest after climbing about 600ft. We then followed the ridgeline west for another 1/3mi to reach the summit of Peak 4,740ft around 1p. The peak provides good views of Saline Valley to the west, Ubehebe Peak to the south, and a rather impressive side of Peak 5,201ft to the north. The colorful limestone stripes adorning the mountainside suggested it would be a good climb. After spending about 20min at the summit, we started down, Brian and Tom choosing to return along the ridgeline we'd ascended to reach the deep saddle between the two summits while I chose a more direct route off Peak 4,740ft. Though loose, the limestone provided more traction than other rock types and I had little trouble dropping down the steep gully I had chosen before traversing over to the saddle. Tom and Brian were only a minute behind me in reaching the saddle, so neither route proved to have an obvious advantage. The three of us then ascended 1,100ft over the course of a mile up Peak 5,201ft's South Ridge. It was as good a route as we could have hoped without the looser slopes we'd found on the first summit, neatly bypassing the sandy slopes to the west. It took an hour to get from one summit to the next where we found a register left by Sue & Vic Henney in 2014. Knowing they had reached the summit years earlier, we added entries for John Vitz and Bob Sumner before adding our own. Anticipating a fun descent, Tom led us off the summit and down the sandy slopes he'd eyed several hours earlier. We found the sand broken into two sections, an upper slope followed by some broken rock, then a longer lower sand section. Not able to see the lower section from above, we had to guess at its location and missed it somewhat. Tom led us down a narrow gully just south of the sand slope we'd eyed from below, but it had enough sand in it to be quite interesting on its own and it made for a descent nearly as fast as the more direct route would have been. More walking along the desert flats at the end got us back to the Jeep not long before 3p. On our drive back south we stopped at the Racetrack to visit the Grandstand and the famous moving rocks. The Grandstand is aptly named as the only formation sticking above the otherwise smooth surface of The Racetrack, looking much like its namesake at a racing venue. The highpoint is 30-40ft in height, a stiff class 3 slab climb from the west. We followed a family of four that had arrived shortly before us on their way to check out the formation. The playa was hard and dry and safe for walking. One can't help but note the foot, wheel and yes, even stroller tracks, that had been left by those who chose to come out in wet conditions. We scrambled up to the top of the Grandstand before continuing the fun along the spine of the formation on our way back to the Jeep. We stopped a second time at the south end of the Racetrack to check out the moving rocks which are more plentiful on this side. We found a number of specimens which we duly photographed, pondered and discussed before heading back over Lippincott Pass in the Jeep. On our way back through Saline Valley I was keeping an eye out for another bonus peak to fill out the day. We'd already started on our beers and changed out of our boots but I had yet to give up the cause. I found a good candidate just east of Saline Valley Rd at the far southern end of the valley, but it took some effort to convince Tom (Brian was far easier to enroll in additional adventuring). It wasn't until we discovered the road makes a fortuitous turn on the backside of the feature to get within half a mile that Tom relented. There is a spur road leading to a couple of nice backcountry campsites that we used to get as close as possible on the peak's south side. We changed back into boots, locked up the Jeep and set off up the boulder-strewn slopes, reminiscent of the Cockscomb Range in Joshua Tree NP. Our hour-long detour turned out to be well worth the time and effort as we had both some fun scrambling and the opportunity to see two bighorn rams that let us follow them for 10-15min before they disappeared for good. The highpoint was the largest of several giant boulders adorning the summit, though it offered no special views.